If gravity has changed since the age of the dinosaurs, it might have been due simply to the Earth expanding and becoming more massive. Expansion would increase gravity if the center of the Earth filled with new material. This is somewhat of a radical suggestion, since most people are not at all comfortable with the creation of matter from nothing. In the 1960s oceanography came up with some surprises. First of all, it was recognized that the ocean beds were not filled with miles and miles of sediment, as would be the case if the world's rivers had been carrying silt to the oceans for four billion years. Instead it was found that the ocean floors were geologically new. 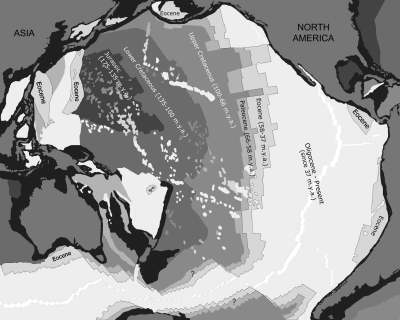 The second surprise was the discovery of the Atlantic ridges, a series of parallel ridges which run mostly north and south throughout the Atlantic. The ridges show a series of parallel magnetic reversals of the top layers of rock, matching east and west from approximately the center of the Atlantic. Further research has found the same in the Pacific and Indian oceans, although of a more complex pattern. Geological dates of the ridges also match from the center out. The oldest ocean beds are just east of China, with smaller stretches just off the North American east coast and in the South Caribbean. These regions date from 180 million years ago -- from the Jurassic era (200 to 150 mya), the second era after the end of the Permian and the era of the giant dinosaurs. It looked like the Earth had indeed been expanding, and in fact it looked like there were no oceans before the Jurassic. That means the original landmass, Pangea, the single landmass which had already been suggested as the parent to all of today's continents, must have covered all of the Earth at one time. The start of ocean floor spreading (as it is called) dates from after the first appearance of the giant dinosaurs during the Jurassic. You can look at a globe and make some simple calculations. Subtracting the estimated average width of the Atlantic and Pacific from the current circumference of the Earth (25,000 miles, 40,000 km) gives an earlier circumference of about 12,500 miles (20,000 km). The Earth has roughly doubled in diameter. S. Warren Carey in two books, The Expanding Earth (1976) and Theories of the Earth and Universe (1988), suggests that 200 million years ago (at the Jurassic) the Earth was only half its present diameter, and completely enclosed by Pangea, the single landmass which today has been torn to smaller pieces. Expansion of the Earth split Pangea, forming the current ocean basins in the process, which filled with water -- some as runoff of the shallow continental seas, most of it probably welling up from within the Earth. Ocean-bottom thermal vents and volcanoes spew out water and water vapor. The second book suggests that matter is being created in the center of the Earth. Carey and his followers in fact suggest that the expansion is not linear (as implicit in my abbreviated formulation) but exponential -- that is, it is a function of the mass already accumulated. They say very little about gravity. Many of Carey's followers are not comfortable with his second book and are extremely reluctant to suggest the creation of new mass. The creating of mass does not contradict current physics, and is in fact a postulate of quantum theory. (Exception could seriously be taken with both of these statements.) But many people have serious philosophical problems with the creation of anything new out of nothing. Before the Jurassic there were no oceans, only shallow seas located on the stretched-flat inland areas between mountain ranges. There may have been a southern ocean. This was also before the recent orogeny -- the set of mountains identified as the Alps, Himalayas, and the Rockies (the whole of the Cordilleras, which includes the Andes). Mountain ranges are clearly the result of a solid landmass crumpling as the radius of the substrate on which it rests increases. Mountains are thus hollow, and provide easy access to the surface for material welling up from the substrate. The large flat mid-continental basins are stretched areas, often with faults where the Earth shears (due to stretching of the landmass). The process of stretching landmasses and curling the edges (mountain ranges) can only account for some of the expansion. At some point the original single continent would rip and the fault would widen and fill with new material from within the Earth. This clearly shows in a mapping of ages of the ocean crusts. The shapes of the continents are exactly what would be expected if the peel of an orange were to be forced onto a sphere of twice the original diameter. Wedge shaped areas would remain after the original peel started to crack. Antarctica was originally attached to Northeast Asia (as fossils testify), and butted up against North America. Antarctica eventually was rotated and pushed to its southern polar location by the new ocean floors which welled up around it. Australia touched up against South America on one side (and marsupial mammals ended up in both continents) and Southeast Asia and India on the other. East Africa was up against India. North America was located against Europe on one side and Asia (with Antarctica still between) on the other, South America was against Africa. Europe had not tried to pull away from Africa yet. As you can see, this originally was a small globe. Some questions remain. Is the Earth still expanding today? Even if this were so, it would be totally undetectable. Carey and others think expansion continues, at an increasing rate. Did the expansion happen gradually or in spurts? Carey suggests a continuous exponential expansion. Exponential expansion would reduce earlier changes to less significance, that is, the expansion only became very noticeable after the Jurassic. Others have suggested, based on biological (evolutionary) considerations, that gravity may have increased in the period before the giant dinosaurs of the Jurassic and then have fallen again. The bands of magnetic reversals detected in the east-west direction from the center of the Atlantic Ocean floor suggest sporadic expansions. The intensity of the reversed orientations are weaker compared to the normal orientation. It is possible that the reversals mark plasma contacts with Saturn, although the data for reversals of magnetic orientation are sporadic and do not seem periodic. The number of reversals increase in frequency about 35 million years ago (some 20 instances), and become much more frequent during the last million years. These last are recorded also in sedimentation layers in the Balkans, and thus may represent data not available for earlier periods as found only in molten rock. Some researchers have agreed in concept with the idea of an expanding Earth, but not in scope. Some have suggested that only a 20 percent reduction in gravity would suffice to allow the giant dinosaurs and plants. But this does not match the additional circumference due to increased oceans, or the age of the ocean bottoms. It might also be suggested that the Earth simply bloomed, that is, it became larger without gaining mass, like bread rising in an oven. But that would decrease gravity, not increase it. Similarly, the plasma theorists suggest that gravity is a function of the electrical conditions of the Earth, and is perhaps affected by electrical fields exterior to the Earth. Again, this does not account for the dated ocean floors, the movement of continents, or the doubling of the Earth's diameter. It does, however, match my supposition that Earth became a planet of the Solar System, and thus affected by the electrical field of the Sun, after the Permian, 250 million years ago. "The crust of Pangea was 'sial,' heavy in silicon and aluminum elements, as is the crust today. Its depth was uniform; at about 30 kilometers it developed, but very gradually, into heavier silicate magnesium mixtures ('sima')." "... All the recent vulcanism, seismism, and crustal churning has added little to the sial, for the magma below is not provided with the materials for its manufacture." "There is no evidence that the oceans have destroyed and buried continental material, or could have, since the sial and its sediments are lighter than the sima of the ocean floor." "The fossil marine beds that are found upon the land today, even high up in the Himalayas, are once-flooded land-beds or they are Pangean shallow water formations. They are the relics of deluges, tides and certain risings visited upon the world by post-Pangean catastrophes. There are few fossil marine beds laying conformably upon plutonic or basaltic sima." For 3.9 billion years the crust of the continents has been floating on the substrate. Then some 200 to 250 million years ago heavier material from within the Earth started to well up to fill cracks which had started to develop. 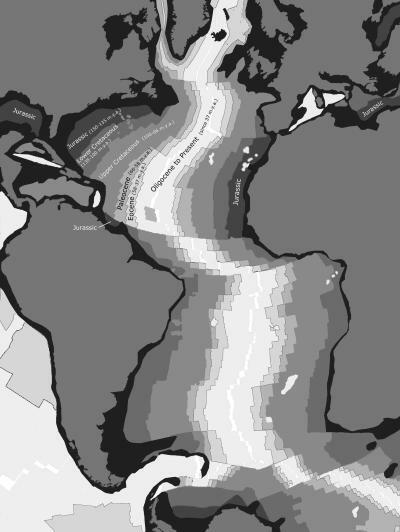 It is the spreading ocean floors that have moved the continents. We can recognize unfilled cracks today. One runs almost the whole length of Africa and on into Southwest Asia. Ted Holden at [www.bearfabrique.org] and Robert Bakker The Dinosaur Heresies (1986). a = f ( r^3 / r^2 ). There are suggestions also that gravity may have reduced initially during the time preceding the Jurassic, and then started to increase. This is mainly based on the rather compact proto-mammalian and proto-saurian animals of the earlier Permian period. If the diameter doubles, the mass will increase to 8-fold. where 6 * 10exp24 [kg] is the current mass. which is about one percent of the mass of Saturn. Size of this page: 2595 words.